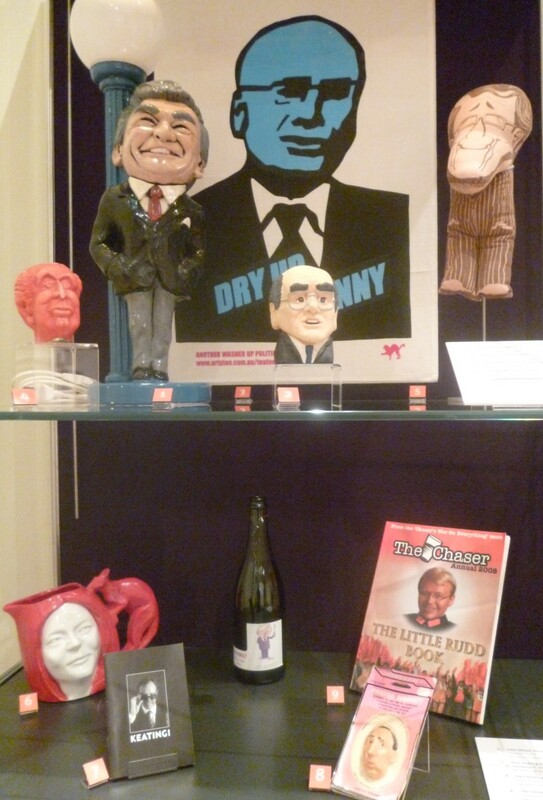 We’ve just made some changes to the ‘light-hearted gallery’ within our Prime Ministers of Australia exhibition. This gallery features objects that demonstrate how Australians revere, revile or ridicule our leaders. Although many objects were created with a certain irreverence, they also document national events and concerns. One of the objects now on display is a light depicting Bob Hawke, Australia’s 23rd prime minister, relaxing under the glow of a street lamp. 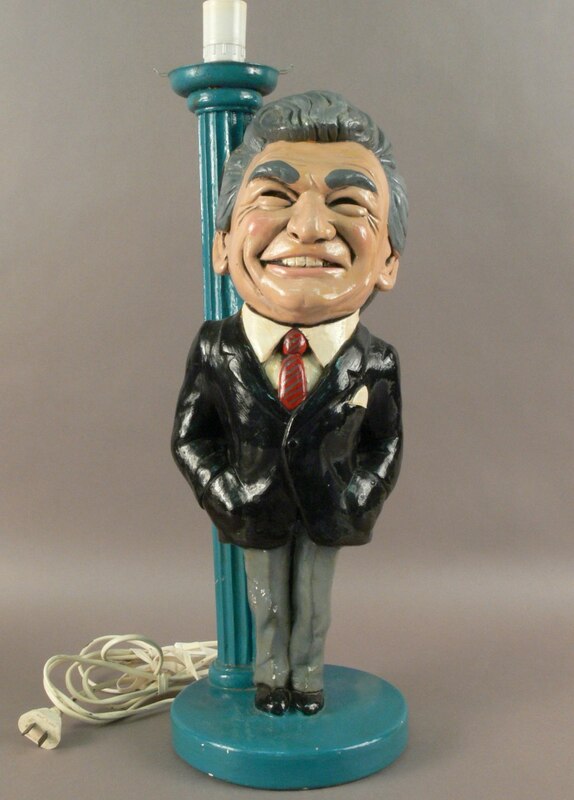 Mr Hawke was a Rhodes Scholar but his larrikin, blokey persona was a memorable aspect of his prime ministership. Given his world record for speed-drinking, it’s hard to tell whether the sculptor designed Mr Hawke to be merely leaning against the street lamp, or propping it up. Still on the subject of alcohol, we’ve also installed a bottle of Grande Cuvée NV champagne branded for the Kevin07 campaign, one of the most recognised political campaigns in Australian history. 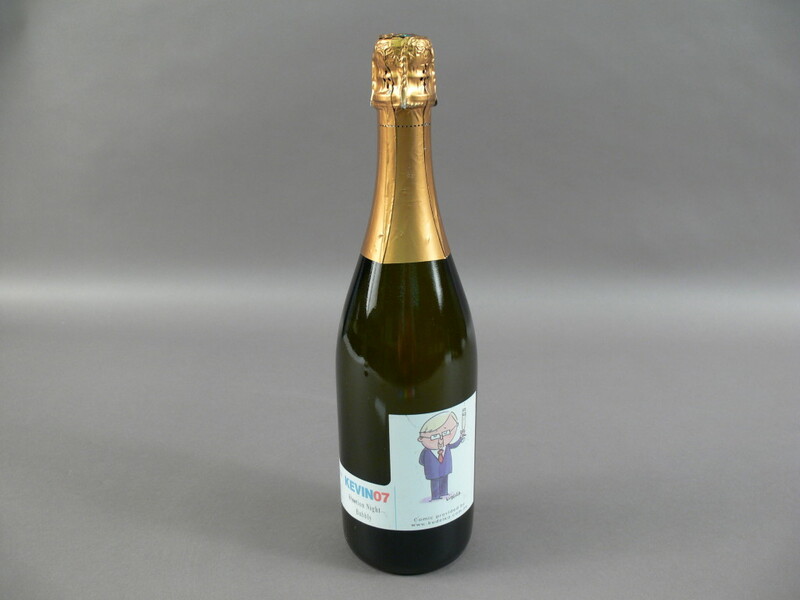 The label features a cartoon by Jon Kudelka and indicates that the bubbly was destined for consumption on the night of Mr Rudd’s election. The bottle remains intriguingly unopened. Continuing the theme—which perhaps reflects the fluid state of the prime ministership in recent weeks—we have added a ceramic jug depicting Julia Gillard. It was very kindly donated to us by its creator, Graeme Foote. ‘I was very pleased to have at last a female PM regardless of political persuasions,’ he said, ‘and felt that I should make a commemorative jug of her, as there can only be one first female PM’. Mr Foote gave another jug to Ms Gillard, but whether it is currently holding water, milk or something stronger is anyone’s guess. Stephanie survived more than a decade in the publishing industry before turning to environmental and cultural heritage management. After working on the conservation of Mawson’s Huts Historic Site, Antarctica, she swapped the ice for the outback, coordinating community education initiatives in the Shark Bay World Heritage Area, Western Australia. In 2009 she joined the curatorial team of the National Museum of Australia, then worked at the Department of the Senate and Questacon. She became a curator at the Museum of Australian Democracy at Old Parliament House in December 2012.